Measure M News: There was considerable press coverage of a court ruling Tuesday that upheld the ballot language of Measure M, Metro’s sales tax ballot measure that goes to voters this fall. A coalition of seven cities had filed a lawsuit over the language. Here is Metro’s statement. Press coverage: Streetsblog LA, LAT, KPCC, Press Telegram. Meanwhile, the SGV Tribune has a story looking at groups supporting and opposing Measure M. Measure M proposes to raise the countywide sales tax by a half-cent and to continue the Measure R half-cent sales tax after its current mid-2039 expiration date. Click here to learn more about the ballot measure. Over the holiday weekend, I active transported myself into the Eastern Sierra. If you can name the above mountain, email me and I will use Metro’s internet channels to declare you the Greatest Government Blog Reader of All Time for Two Days. Quasi-related: In 20 years of visiting the Eastern Sierra, I had never been in a traffic jam on U.S. 395. That changed Monday night when southbound traffic backed up for two miles from Olancha — where the road narrows from four lanes to two. 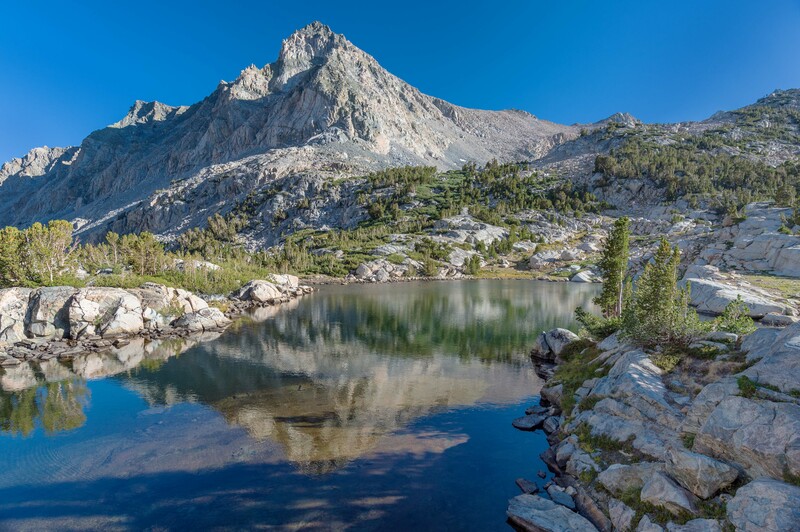 It feels to me that more people than ever are visiting the Sierra, perhaps because it’s so easy to research, book and promote destinations on the bad ol’ internet. Quasi-related: it certainly felt like autumn above 9,000 feet — and there was even some sleet on Saturday and the aspens were starting to turn. A La Nina is predicted for this winter, which normally favors northern climes in the West. I say: don’t invest too heavily in what the weather-industrial complex has to say. See: the El Nino of last winter, which produced a solid snow year in the Sierra but didn’t end California’s drought. This accident was apparently caused by a tractor trailer trying to beat a train at a street level crossing. The crash in early 2015 in Oxnard involved a truck that turned onto the tracks and into the path of an oncoming train. Metrolink, to its credit, has aggressively pursued positive train control to prevent collisions with other trains. But the above accidents demonstrate an ongoing challenge for our region’s commuter rail and light rail: keeping trains and cars apart even when there are crossing gates. The injuries were thankfully minor on Tuesday but scary nonetheless. Neal Broverman takes a look at the Crenshaw/LAX Line Northern Extension project, which is included in the Measure M sales tax ballot measure plan. He specifically focuses on a map and three concept routes from a 2009 feasibility study by Metro, weighing the pros and cons for each. As Neal notes, it’s possible to make an argument for following four different streets — San Vicente, Fairfax, La Cienega or La Brea. He makes compelling pro and con arguments for each and, to my ears/eyes, sounds most optimistic about San Vicente. My three cents: I don’t think a big turn west before going east is a big deal because I think this is a line that could attract a lot of riders making short-range trips — i.e. WeHo to Hollywood. I also want to emphasize the other huge benefit of this line: getting riders from the Crenshaw/LAX Line south of the 10 to a connection with the Purple Line on Wilshire Boulevard. That would make it a ton easier for riders coming out of the communities along the Crenshaw/LAX Line to get to places such as Century City and Westwood while also making it easier for many riders to take the train to the airport. Under the Measure M expenditure plan, this project would break ground in 2041 and be completed in the 2047-49 timeframe. This project has also been identified by Metro as one of four (the others are the Artesia-to-DTLA transit project, Sepulveda Pass Transit Corridor, High Desert Corridor) that would be a good candidate for possible acceleration as a public-private partnership. Dept. of South Korean Transit-Related Zombie Movies: “Train to Busan” was released over the summer but has been picking up some press in the past couple of weeks. It looks like a healthy mix of “Snakes on a Plane” and “World War Z” — which I thought was really entertaining. In the meantime, I’m eagerly awaiting season six of “Walking Dead” to drop on Netflix. Hope it’s a little darker than season five! These prospects go some way to explaining a valuation higher than the market value of 87% of firms in the S&P 500 and more than a third higher than that of General Motors, which had a gargantuan $152 billion in sales last year. Unsurprisingly, a valuation of around 17 times the loss-making company’s 2016 revenues spurs a certain amount of scepticism. Such a figure can be justified only by lots of future growth, which will cost yet more money. But when Uber goes public, perhaps as soon as next year, in order to provide an exit for current investors, will its new shareholders be willing to tolerate continuing losses in the name of growth? There are other questions, too. Are the barriers to entry in Uber’s business high enough to defend it against rivals such as Lyft in America, Ola in India and Grab in South-East Asia, and from future competition from the likes of Alphabet’s Google? Will regulation hamstring its growth? And perhaps most crucially, how will it manage the transition to driverlessness? The firm’s long-term success lies in changing the way people and goods get moved around—exactly the area that autonomous vehicles will disrupt. The company feels a pressing need to navigate this technological change before the carmakers and rival technology companies provide competitive visions of the future of transport, and of who will profit from it. The article goes on to stress that offering cheap rides is huge to Uber’s success thus far at attracting riders — and draws parallels to Amazon’s similar strategy, as well as Facebook’s early lack of profits. I’m not sure how it will all shake out but I think the big question to be answered in the future: will ride hailing ever make a real dent in car sales and/or private car ownership? Quasi-related: kudos to the musical tastes of the copy editor who wrote the subheds. The 82 apartments will be a mixed-use building in NoHo at the intersection of Chandler and Tujunga. Related: Metro is working on a plan to develop four parcels surrounding the NoHo Red Line and Orange Line station. In June, the Metro Board approved a six-month negotiating period with two firms (Trammell Crowe and Greenland USA) to develop Metro-owned properties surrounding the NoHo Red Line and Orange Line stations. Steve: I like your 3 cents on Crenshaw north, and I like the San Vicente alignment too. The vast majority of people riding this line will be making short trips – 3-6 miles – so the project should be designed to serve the people within the corridor, not the people traveling through the corridor. So I say design the project to serve as many high density locations within the corridor as possible. For the people that want to make longer trips between south LA and the Valley they will have options to use either the Blue Line to the Red Line, or the Sepulveda Pass Line. And an added thought: north-south driving in the L.A. basin is a bear (not that east-west is a picnic). I think travel times from (for example) Marine to Hollywood would be competitive with trying to drive that route — even if a train swings west then east (if the project turns out to be a train; again, it hasn’t gone through the environmental process yet and no mode has been chosen). Hooray for Measure M’s courtroom victory! Now hopefully we can get a big victory at the ballot box. As for the West Hollwood/ Crenshaw North route, I personally hope to see a San Vicente alignment chosen right into the heart of Weho…but fairfax wouldn’t be bad either. La Brea, i think, is the least advantageous route of the three. I do think metro needs to put this one in the high priority category and speed up it’s construction. It’s an important extension and a central route for jobs, locals, and tourists in our region. It would really change peoples perception of public transit in this city as much as the purple line extension will and the expo to Santa Monica has. I believe it would be enough to change commuter patterns and behavior in the most central and dense part of our region ( South la- hollywood….dtla – 405). If you coordinate the buses right, then most of these central places in L.A. can be accessible within a short transfer and ride. A once dauntingly big city will be made smaller and more manageable. I moved here 15 years ago, and the additions to our transit system made since then have made this true for me and the people I take around town. These new extentions, most especially the ones that run through the dense center of the region…could really cause a sea change. Thanks, Steve, for pointing out the “huge benefit” to getting the Crenshaw/LAX line extended up to the Purple Line. The Purple Line is much better suited to handle the extra capacity from the Crenshaw / LAX line than is the Expo Line, which already is having overcrowding issues. As you also have previously pointed out, this also will greatly benefit transit users in the South Bay because the Crenshaw / LAX line will use the existing Green Line tracks to get down to Redondo Beach and ultimately to Torrance. When the Crenshaw / LAX line is extended to the Purple Line, South Bay residents will be able to get direct one-transfer service to Westwood, Beverly Hills, Century City and DTLA . To speed things up, perhaps the Crenshaw / LAX line’s northern extension can be divided into two phases: Phase 1 to the Purple Line and Phase 2 to WeHo? Great points. As for phasing, we’re obviously a long way from making those kind of decisions. But hypothetically, yes that is an approach that has been done before — Gold Line, Purple Line, Expo Line and even the Crenshaw/LAX Line. The studies for Crenshaw looked at a bigger study area and the decision was made to first build between Expo and Green Line with a possible northern phase in the future depending on funding. San Vicente! Stations at: Rimpau terminal, Wilshire/San Vicente with a pedestrian connection to the La Cienega Purple line station making a beautiful transit nexus in BH, then Cedars/Beverly Center, a station at SV/SM blvd where the Metro yard/Sheriff station is, La Cienega/SM blvd, Fairfax/SM Blvd, La Brea/SM Blvd, Hollywood/Highland and while I’m just making wild dreams a final terminus at the Hollywood bowl! San Vicente has the history and is wide enough Metro could save some money with running some surface level from Rimpau to Wilshire. Then going underground and giving WeHo what they have dreamed of forever a full subway with a connection to LAX and Hollywood Bowl & Red and Purple lines! Extend it to the Purple Line. No farther. WeHo can build a streetcar to connect the Red and Purple Lines, since it’s mostly to serve 3-6 mile trips. Why should the region pay ? Why should the region pay for anything? I am sure all those serial complainers in the valley really want to be able to transfer at Hollywood and Highland and head to WeHo the grove, or down to LAX. We would never hear the end of it. I live in Ktown, right on top of the red and purple but I would still like to see the crenshaw line connect the two to my west. That said I think WeHo needs to learn to live with above ground trains. Particularly if San Vicente is chosen. Underground is just too expensive. DON’T DO AT GRADE. DON’T DO AT GRADE. DON’T DO AT GRADE. DON’T DO AT GRADE. DON’T DO AT GRADE. Learn from the Blue, Gold and Expo lines: at grade rail not only opens the door for train collisions, it FORCES trains to operate at a slower speed than optimal, and puts them at the mercy of street traffic. It also negatively impact auto traffic on those streets, resulting in the double whammy of (1) slowing down the train and (2) slowing down cars. Adding potential train/auto fatalities AT GRADE = LOSE – LOSE – LOSE. There’s a good chance this won’t be at grade. Also, other places have at-grade rail. It’s not at grade rail that’s the problem, it’s humans that are the problem. 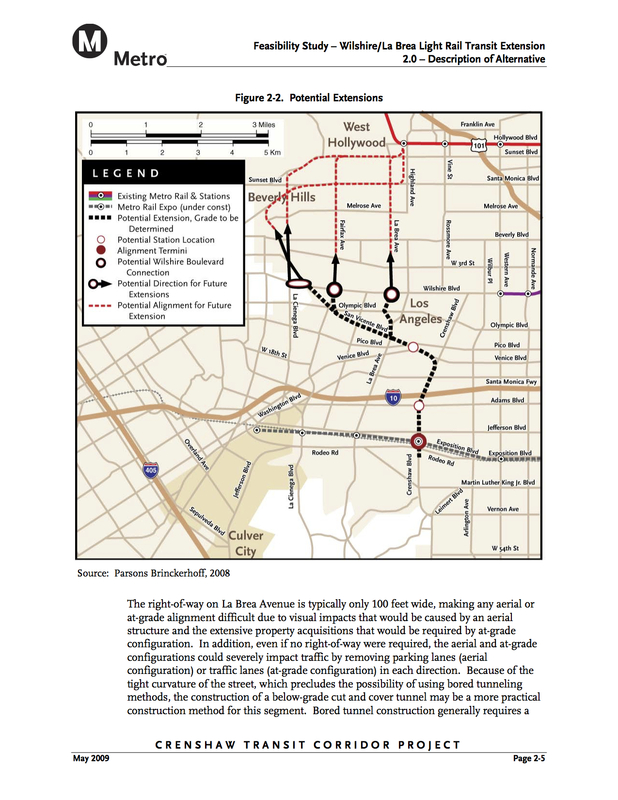 Also, if I recall, when the Pink Line was ultimately shot down, I read from somewhere that the WeHo corridor would be better served by a “Light Rail SUBWAY,” pretty much hinting that a rail line in the Hollywood-WeHo-Miracle Mile-Mid-city area will have to be underground. It would be a lot cheaper to run it at or above grade than trying to bury the entire thing. Particularly on San Vicente, which is so wide and desolate I cant see why you would pay the premium for underground the whole way. Walked up San Vicente today and saw surveyors which made me a little excited. They were doing the school on Fairfax though. Id definitely take a stop at Olympic/SV/Fairfax too. Although close, La Brea would be deserving, and maybe even Hauser. Things like the Crenshaw Extension North could breathe so much more life into the system and circumvent a major gap in the system due to the geography on that side of town. Hmmm… what will these permanent sales tax increases do to the long-term sales tax rate? LA county sales taxes are currently pretty astronomical. I realize on this blog any negativity toward public transit spending will be very poorly received, but… This measure, superficially, sure looks like a mish-mash of various unrelated projects that should be reviewed, voted on separately. And there may be good reasons for all these projects, but it won’t be traffic reducing. Selling this measure as traffic reducing is disingenuous. My trust in the statements of Metro officials took a big hit with the Goldline extension. $1 billion+ for a very nice rail line that is running at a fraction of its potential ridership. Metro got its shiny new toy, and the budget that goes with it, without bothering with the pesky parking infrastructure necessary, in a suburban area, for the line to be used to its full potential. Now we’re being asked to give Metro an unending “pot of gold”, with a grab bag of various projects to justify it. I find that …concerning. Here is the list of current sales tax rates in the different cities in Los Angeles County: http://www.boe.ca.gov/app/rates.aspx?LETTER=L&LIST=COUNTY. In most cities, the current rate is 9 percent; a handful have higher rates. The only “ridership problems” that the gold line has is not enough space. That train has well exceeded ridership projections. And if the only purpose of transit is to get rid of traffic for you and your car, you should consider who the real problem is. Remember, you are not stuck in traffic, you ARE traffic. Agree with your 2nd statement, which was my point. Measure M is a large, permanent sales tax increase being marketed as improving traffic. I see that as a disingenuous. IMO the measure has the appearance of: let’s slap together a bunch of disparate projects, call it “a plan”, and try for a permanent tax increase to fund our budget. I’m skeptical. As far as the Gold line exceeding ridership projections, I can only conclude the people that created those projections hadn’t driven in 210 rush hour traffic for an extended period of time. Commuters from east LA County, who work in Pasadena or LA, are desperate for an option to the 210, but after 7:30 the Gold line is running at least half empty because the few hundreds of parking spots that were built are looong gone. And this isn’t just the Metro’s infamous “last mile problem” excuse. I’m in LA county, but 10 miles from the nearest stations (Citrus APU and Irwindale) and that’s typical of the people who would love to use the Gold line extension but can’t due to the lack of 6 P’s or purposeful decision to go cheap on the parking. The space was available to greatly increase the parking capacity along the Gold line extension, it just wasn’t used. And other options to get to the stations are limited to non-existent. All of this gives the appearance of Metro not really caring about maximizing ridership, which further make me skeptical of Measure M.
Without bundling together, none of the measures would pass at the county level. Certainly not 66% that is needed in California. Locally southern California is too fractured to get anything done at the small scale. The Gateway cities are not going to be able to come together and build a rail line into LA City that they desperately need. The Valley is not able to tax itself and then get together with Santa Monica+ Westwood for the Sepulveda Pass or Glendale, Burbank, and Pasadena the northern cross line built. How would you even try to allocate the widening of the 405 and the 5? I’m also pretty sure that it will ease traffic. Only 35% of it is going to Rail/BRT construction. Another 35% is going to expand roads, both highway and local. 20% is going to operate additional trains and buses, which will help too. It won’t end traffic though, it would take a lot more than $1 billion a year to do that in Southern California. You mention that formal studies have yet to begin, but wouldn’t Metro need to have completed these already in order to design one of the three Purple Line stations currently under construction as a future transfer station? As fas as Crenshaw routing, here’s my two cents: go with Fairfax. It’s worth it for LACMA and Farmer’s Market/Grove alone, which are huge draws for locals and tourists alike. It’s true that further north this puts you toward the eastern end of WeHo, but it’s actually dead center within the most urban, lively, and walkable portion of the city, which is the Santa Monica Blvd. corridor between La Brea and La Cienega. The Sunset strip is just that…a strip…and Metro wouldn’t pull much ridership from the limo and towncar set anyway. It doesnt make sense to pick a route just yet, need to do engineering studies to figure out what the cost might be. The proposed northern extension of the Crenshaw/LAX line should serve West Hollywood. It is the one part of LA that has wanted rail from the beginning! The alignment has to go along either San Vicente or La Cienega so that the train line can properly serve WeHo. 2049? We’ll be beaming places by then. I got caught in the same traffic jam. I think it was mostly because of the Burners. Caltrans District 9 has a project to bypass Olancha, which is now in the environmental study phase. Did you see the trucks trying to bypass by way of the DWP and aqueduct maintenance roads? The Inyo County sherrif was not amused! What are ‘burners?’ That’s interesting about the bypass. I knew Caltrans was planning to make the two-lane stretch between the Ridgecrest turnoff and Red Rock S.P. into four lane. I generally don’t like to see rural roads expanded, but I do think that will make the 14 safer. I did see some trucks using the dirt roads. Crazy. I guess the upside is if I’m going to be sitting in traffic, it’s better to be in a place that’s scenic. Probably means the end of the Ranch House Cafe. “burners” as you should know are Burning Man folks, returning from the festival at the end of the Labor Day weekend. And those traffic jams on 395 do happen in ski season. Meanwhile, off to that lake! Which I do believe is Cottonwood Lake. I think I recall Metro did not build a station for the Purple line nor did Metro consider building a “shell” to build a station at Crenshaw and Wilshire. Having the Crenshaw line continue north to Wilshire without having a station would mean customers would have to walk to the nearest Purple line station which I believe would be at Wilshire and La Brea or Western and Wilshire. Will Metro build another Purple line station at Crenshaw/Wilshire if that route is chosen? As to the prospective routes for the Crenshaw extension/Pink line: If you look at the area between Santa Monica/La Cienega and Hollywood/Highland on Google Satellite view, you’ll see a curious diagonal stretch of right of way. Though it wouldn’t be easy to make that the actual at-grade route, if that section goes underground it would vastly simplify construction, with minimal disruption to above-ground structures. Maybe even some cut-and-cover segments. Check it out. And dig up some historical photos of the area.